With the release of Steve McQueen’s film 12 Years a Slave, historians, journalists, and others have begun to offer insights online and in print on slavery and freedom in antebellum America. In particular, significant attention has been paid to “slave narratives” like that of Solomon Northup. Such discussions about slave narratives published in the antebellum North have led me to think about the connections between these stories and tales of voluntary enslavement from the antebellum South (for the sake of clarity, I will use the term “freedom narrative” when discussing stories published by former slaves about their life in and escape from slavery; I will use “enslavement narrative” when discussing stories of voluntary enslavement). Though these stories have received far less attention from historians, their structure and the timing of their publications seem particularly germane to some of these recent explorations of slavery and freedom. While these freedom narratives have proved to be largely factual, it is nevertheless true (as Kachun notes) that abolitionists played crucial roles in getting these stories published and popularized. In addition, once published, freedom narratives were crucial tools for abolitionists, providing first hand accounts of the horrors of slavery. Supporters of slavery, of course, denied the accuracy of these freedom narratives and defended the institution as benign, civilizing, and of greater service to blacks than the free labor system. I would like to suggest, however, that not only did proslavery advocates deny the accuracy of freedom narratives, they appear to have attempted to provide a contrasting view through the publication of voluntary enslavement stories in southern newspapers. Stories of voluntary enslavement represent what I see as a counter-narrative to the popular stories of former who slaves who escaped to freedom in the North. Like freedom narratives, stories of voluntary enslavement seem to follow an established storyline, one that mirrors freedom narratives in crucial ways while supporting to the proslavery position. Enslavement narratives typically hit a few key points, and in my view offer just enough detail to make them recognizable as a response of sorts to popular published freedom narratives. In these stories, a black southerner (often a recently manumitted or fugitive slave) leaves their home and heads north. Once they arrive in the North, they find they are poorly treated, have difficulty making ends meet, and often become ill. Thus, they return to the South, often to their former master, and voluntary re-enter slavery. As these stories only began to appear in the late 1850s, southern newspapers thus published stories of voluntary enslavement into a world well aware of the content of popular freedom narratives, offering them as a counter narrative to support their view of the institution of slavery. Whereas freedom narratives stressed the inhumanity of slavery as well as the abilities of former slaves, these stories of voluntary enslavement emphasized the “positive good” of the institution as well as African Americans’ unpreparedness and inability to survive in freedom. In contrast to well-known stories of enslaved men and women who risked everything to flee the brutality of slavery, survived (and thrived) in the North, and recorded their stories to share with the world, these enslavement narratives purport to reveal that free blacks lacked the capacities to function in a freedom, were often abandoned by the free labor system, and sought every opportunity to return to the comforts of slavery. In May of 1859, Houston’s Tri-Weekly Telegraph published another story of a free black woman named Caroline who chose to enslave herself. Caroline had spent time in North and though apparently fairly well treated there, she decided she preferred slavery in Texas to freedom in New York. The paper also reported that another free black man planned on submitting a similar petition the following week. In closing, the article once again addressed northerners, suggesting “abolitionists reflect on this, and remember that these negroes seek the condition their Creator intended them to occupy.” Once again here, the Telegraph directs this story specifically at northern abolitionists and emphasizes free blacks’ dissatisfaction with life in freedom. In each of these stories, black southerners are ill prepared and dissatisfied with their experiences with northern freedom, and prefer to return to southern slavery. Although the authors of these stories are unknown, and they come nowhere close to reaching the length or level of detail found in published freedom narratives, these enslavement narratives seem to offer just enough detail to be considered a counter-narrative, or perhaps a competing genre. Whereas freedom narratives typically highlighted the horrors of slavery and a successful escape to the North, enslavement narratives reveal the opposite: an ill-fated decision to flee to northern freedom, followed by a comforting return to enslavement in the South. Recently, historians have done excellent work exploring the complicated reasons free people of color in the South occasionally chose to voluntarily enter into slavery. By approaching these sporadically published enslavement narratives as something more akin to a literary genre, I am not intending to level judgment on these stories’ relationship to reality (though the similarity in details does raise some questions). Rather, I would suggest that because such stories are typically only looked at by historians of the free black social experience, we may be missing how enslavement narratives fit into the broader corpus of proslavery thought, ideological exchanges between proslavery and antislavery advocates, and the coming sectional crisis. These stories had some traction. I believe Louise Clarke Pyrnelle’s children’s novel Diddie, Dumps, and Tot (1882) about three little girls growing up on an antebellum plantation includes an episode where a free black woman in the neighborhood died and left her own small children to the planter, knowing they would be looked after as slaves. I don’t know of any other fictional accounts that include enslavement narratives. Interesting, I’ll have to look into that, thanks! 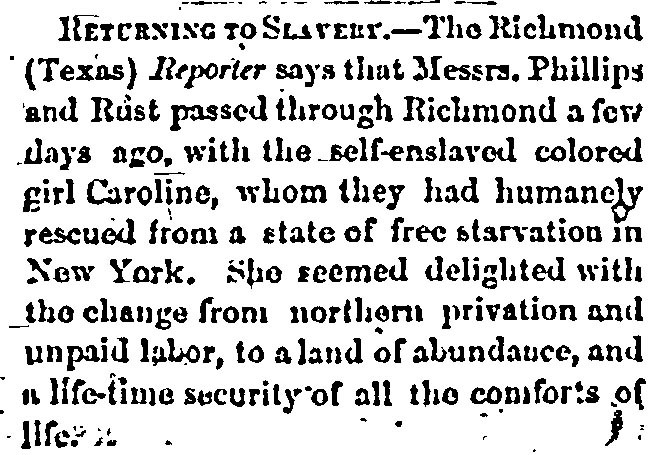 Another thing I want to do (if I decide to continue with this project in one way or another) is look at how freedom narratives were discussed in the southern press, and how enslavement narratives were covered in northern abolitionist newspapers.